To arrest terrorist stabber holing out in Hevron hospital, IDF undercover unit disguises as Arab family, including pregnant woman. 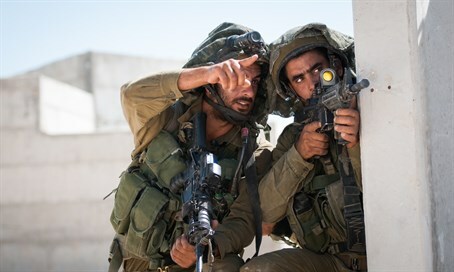 The IDF's undercover unit performed a daring operation at the Alhali Hospital in Hevron early Thursday morning. After learning the terrorist behind a stabbing attack near Gush Etzion was hiding out in the hospital, the IDF, in conjunction with Border Police and the Israel Security Agency, covertly planned his arrest. Posing as an Arab family, including a woman preparing to give birth, undercover agents entered the hospital. They made their way directly to the suspect's room and took him into custody. The man's cousin was shot dead after resisting arrest during the operation. According to the Israel Security Agency, the 20-year-old suspect, Azzam Azat Shabadan Shalaldeh, is "from a family of Hamas terrorists."